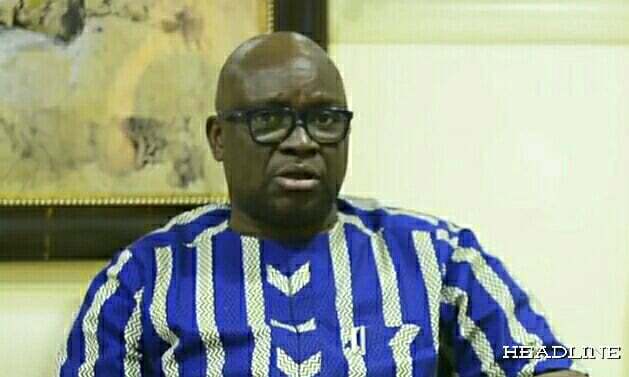 AYODELE Fayose, governor of Ekiti State has called on former president Olusegun Obasanjo to stop acting like a woman and face his travails like a man. Mr Fayose made the call today Saturday in a statement signed by his Chief Press Secretary, Mr Idowu Adelusi in Ado-Ekiti, the state capital, while reacting to Obasanjo’s allegation of frame-up which he said was targeted at him by President Muhammadu Buhari’s administration. The governor while urging the former president to submit himself for probe advised him (Obasanjo) not to make his predicament a Yoruba issue. Fayose making reference to Obasanjo’s book, ‘My Watch’ wherein the former president stated that ‘he prefers to be jailed by Buhari rather than former President Goodluck Jonathan being reelected into office’ said it is good that he is now being served the goodies he saw in Buhari that made him a Buhari’s promoter during the 2015 general election. “To me, former President Obasanjo should submit himself for probe and trial. He gave us the impression that he is a brave man who is not afraid of anything. He is a retired general in the army who has seen a lot and should not be raising alarms now. Obasanjo said Buhari was the best for Nigeria while promoting him for the 2015 general elections. “In his book ‘Under My Watch’, Obasanjo said he prefers to be jailed by Buhari rather than former President Goodluck Jonathan being reelected into office. Now prison is beckoning on him and he wants to dodge. He set up the Economic and Financial Crimes Commission (EFCC), the Independent Corrupt Practices and Other Related Offences Commission (ICPC) and among others. “Obasanjo even used those bodies to hound and lock up many people including state governors, why is he now afraid of being probed. Let him tell Nigerians how he made his money. People can recollect the level he was before he became president and how he left office. If Buhari is now telling the whole world that Obasanjo stole money, it is incumbent on Obasanjo to prove his innocence. “Moreover, Obasanjo should stop giving the impression that he is the leader of the Yoruba people. He is not. We have more eminent people who qualify to be our leaders. And he should also not try and sell any dummy that his travails are that of Yoruba people. I have been tried a number of times by the EFCC and faced the challenges as a man. He should also do so. “In fact, I am laughing at the whole scenario. That Obasanjo could cry out. I don’t know he can act like a woman. It is amazing that he is behaving this way. If he has anything to clarify, let him do that,” he said. Fayose, who described both Obasanjo and Buhari as analogue leaders, urged them to step aside and allow the younger generation to take over the stage. On his criticisms of Buhari, Fayose said they were always done in good faith. The governor said it was unfortunate that some people failed to heed his admonition that whoever brings and rides a tiger may end up in its belly.